I hope every one of you have had a great Easter season and got some rest and lovely meetings with family and friends. Today I want you to show the new book of Jem Weston. It is called “The Knitted Nursery Collection” and contains 14 projects for babies. A lot of you are for sure familiar with her and for those who are not Jem is a freelance designer, author and workshop tutor actually living in Nottingham, UK. She has a great sense for colours and has closely worked with Coats Crafts and Rowan Yarns for years. Her book “The Knitted Nursery Collection” is really an eye catcher. The designs are not only lovely but this book contains designs for every level of crafting skills. From very basic to challenging there is a pattern for everyone. Jem has used different yarns from Rowan to create the most lovely accessories book I have seen lately. Aren’t they cute. Bertie and Bea are little bunnies shown here in Rowan Baby Merino Silk DK. The difference between both are the colour of their fluffy pom pom tails and the ears which are lined with different fabrics. These quilts are shown here in two different colour options as the bunnies above. 8 squares knitted in Rowan Baby Merino Silk DK are combined with 8 fabric squares. The knitted squares are showing four different silhouettes of bunnies, knitted in intarsia technique. The fabric squares also uses four different fabrics. This basket is knitted in two shades Rowan Creative Focus Worsted and felted in the washing machine. After felting it is reshaped while it is still damp. The Flock Pillow is knitted using intarsia technique and is showing a swarm of birds in different colours of Rowan Pure Wool Superwash DK on the front. The back is formed with fabric. This is one of my favourites. These resting birds knitted in different shades of Rowan Cotton Glacé. Make one, make two or ….. The finished size of this pillow is approx. 61cm (24in) square. The front of this pillow is knitted in Rowan Pure Wool Superwash DK. The flutterbies are formed using intarsia technique. The back is made of fabric. These cute little flutterbies are also knitted in Rowan Pure Wool Superwash DK. They are not only great as a decoration but can also be used as a simple toy for your little ones. Or imagine a mobile. Ginger is an adorable little squirrel wearing a scarf in a different shade of Rowan Felted Tweed. Look at this magnificent bushy tail! The Ginger Blanket is using the same shades. The blanket is knitted in panels which are joined together before finishing it with side borders. The blanket can be knitted in two different sizes. These pom poms are recalling the little tails of Bertie and Bea above. It is not only a really simple project but you can use any leftover yarns you have in your stash! Shown here in Rowan Baby Merino Silk DK. Much more challenging is this next project. The Sleepy Owl pillow is knitted in a combination of intarsia technique and fair-isle. It shows a sleepy owl on the front and is knitted in Rowan Pure Wool Superwash DK. The back of the pillow is made of fabric. Knitted in Rowan Cotton Glacé these elephants differs from each other in the colour scheme of the ears, tails and feet. On the picture below you see the colour scheme of the Ollie blanket the Polly blanket is shown on the picture above. Both blankets are knitted in garter stitch using Rowan Cotton Glacé. This simple rug is perfect for rest and play in the house or in the garden. It is knitted flat using Rowan Creative Focus Worsted. After grafting the seam together it is felted in the washing machine. Jem Weston has worked closely with Rowan Yarns and Coats Crafts since 2008, as the Rowan Design Consultant Manager and Coats Crafts Territory Manager. 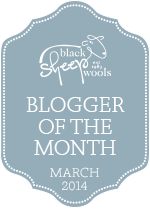 Jem is now a freelance designer, author and workshop tutor with a passion for colour and craft. Jem currently live in Nottingham and is dedicated to passing on knitting skills through inspiring workshops and designs. 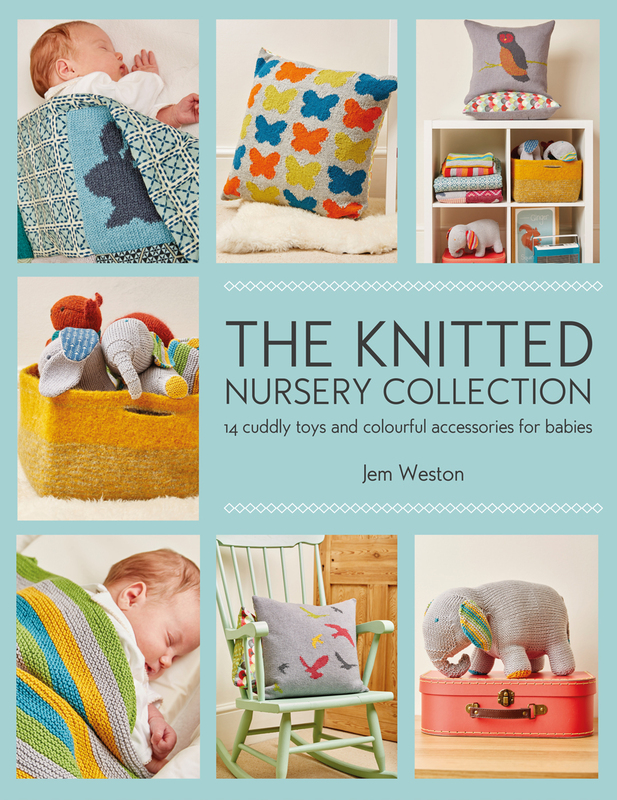 The Knitted Nursery is published in 2016 by Search Press Ltd. This collection is so, so lovely. This little flocks on birds on a branch alone would prompt me to buy the book, but everything else is so cute. Absolutely wonderful. Thanks for sharing. Another knitting book on my Wish list.